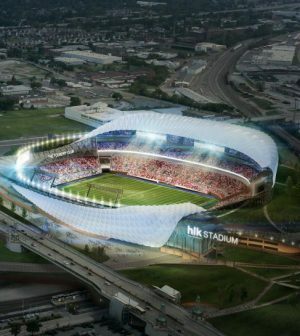 From St. Louis Business Journal: For the better part of the past three years, St. Louis officials were focused on building a $1 billion NFL stadium along the city’s north riverfront in an effort to retain its local football franchise. That plan failed when the St. Louis Rams moved to Los Angeles. But half of that billion-dollars worth of development is still in front of local leaders thanks to a plethora of other sports-related projects across the region. Combined, these projects are likely to request millions of dollars in public subsidies. According to Business Journal research, about $500 million worth of sports-related development is in some stage of planning or development — that doesn’t include the $220 million second phase of Ballpark Village. Two of the proposed projects are in the city — an MLS stadium that is likely to cost at least $150 million (two are proposed but only one would be built), and $160 million in Scottrade Center upgrades requested by the St. Louis Blues. Several other high-profile projects are in St. Louis County — a $42 million domed sports facility in Chesterfield planned by a group led by St. Louis Cardinals manager Mike Matheny; the Blues’ planned $35 million practice facility in Maryland Heights; a competing ice rink in Chesterfield being planned by Michael Staenberg that would likely cost as much as $50 million; an $18 million Topgolf complex on the site of the former Hardee’s Iceplex in Chesterfield; and a $14 million soccer complex planned in Creve Coeur Lake Park.